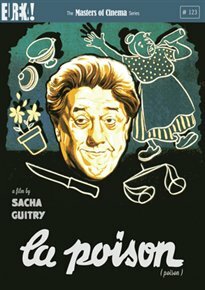 Early 1950s French black comedy from writer-director Sacha Guitry. Married couple Paul and Blandine Braconnier (Michel Simon and Germaine Reuver) detest one another – so much so that they both consider killing the other. As Blandine plans to poison him, Paul fatally stabs her but with the help of brilliant lawyer Maître Aubanel (Jean Debucourt) he may just get away with murder..BLU RAY – £19.99.